After experiencing serious handling issues during the first half of the race, Martin Truex Jr. came roaring back in his No. 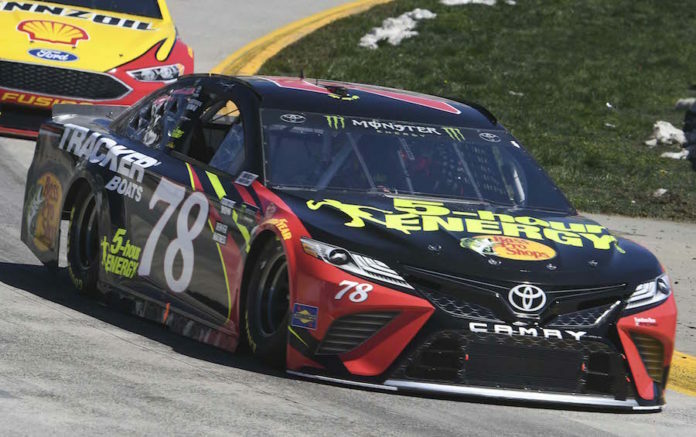 78 5-hour ENERGY/Bass Pro Shops Toyota to finish fourth in Monday’s weather-delayed STP 500 at Martinsville Speedway. It was the fifth straight top-five finish for the Furniture Row Racing driver. Truex’s handling issues were evident early as he was blanked in acquiring points in both of the first two stages with finishes of 11th and 14th. The anomaly for Truex to get shutout with stage points had an impact as he dropped to second in the driver standings, eight markers behind leader Kyle Busch. Crew chief Cole Pearn, sitting atop the pit box, made some key adjustments to the 5-hour ENERGY/Bass Pro Shops Camry, which allowed Truex to gain track position on the 0.526-mile short track. “The last two runs of the race we were really strong, particularly the run right before the last caution,” Truex explained. “We were really fast the entire run. I was able to make some gains and get track position. We tried to make it better but we got worse again. The result was Truex’s fifth top-10 finish in his last seven races at NASCAR’s shortest track. The race winner was Clint Bowyer. Rounding out the top-10 in order were: Kyle Busch, Ryan Blaney, Truex, Kevin Harvick, Joey Logano, Alex Bowman, AJ Allmendinger, Chase Elliott and Brad Keselowski. The race had four cautions for 33 laps and there were 11 lead changes among six drivers. Truex led the first four laps. The NASCAR Cup Series will have Easter weekend off and resume action Sunday April 8 at Texas Motor Speedway in Fort Worth.